Do you have a cherry tree? 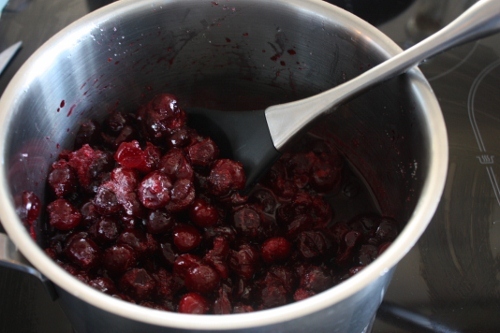 I have a cherry tree in my garden with dark and very tart berries that we get to enjoy through out most of the year, thanks to my mother in law who has picked, pitted and portioned them in little baggies and stored them in the freezer for me. He on the other hand might not agree with that, eating all the desserts I make is forcing him to put on his running shoes and run for miles. He says he does not mind putting in the effort and sacrificing a few miles and little sweat. 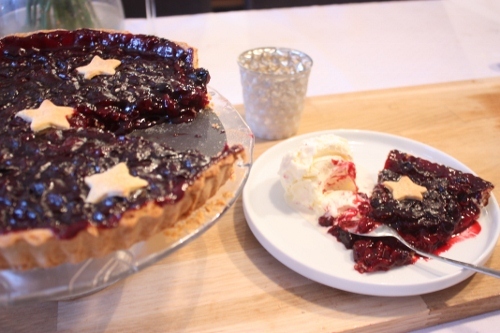 If you like sweet and tart treats, then this is a pie for you. 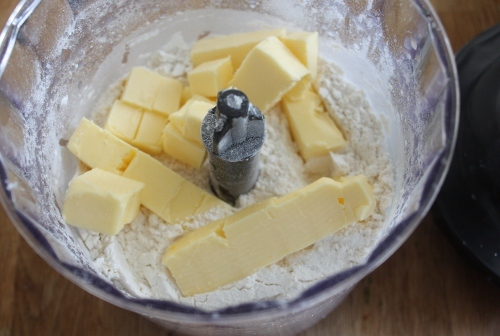 To prepare the pastry, combine flour, sugar and salt in a processor; pulse to combine. Add butter and lemon rind; pulse until mixture resembles coarse meal. 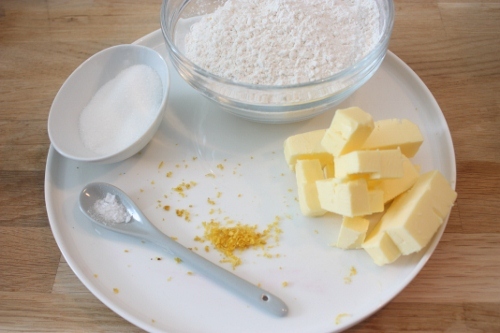 Add egg yolk and 1 to 2 teaspoons of ice water; pulse until dough clumps together. 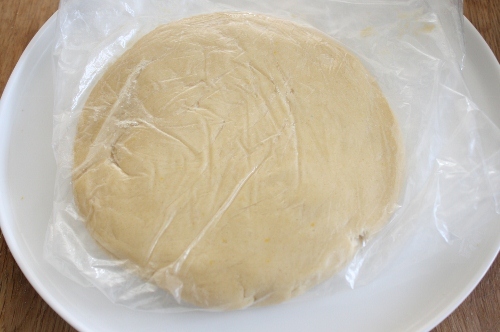 Shape into a 4-inch disc; wrap in plastic wrap and refrigerate about 30 minutes. 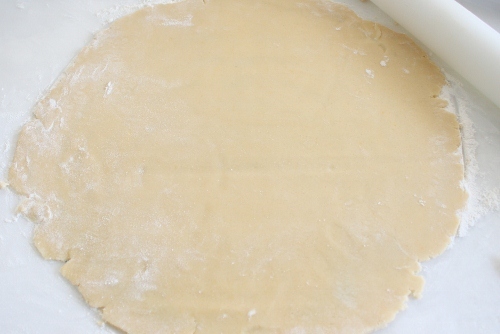 Roll pastry into a 15-inch circle on a floured surface. Place in a 10-inch tart pan with removable bottom. 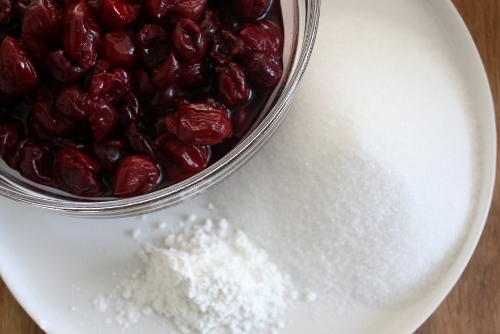 To prepare the filling, coock cherries, granulated sugar in a small pot and add cornstarch to thiken the mixture, sett it aside an let it cool a bit. 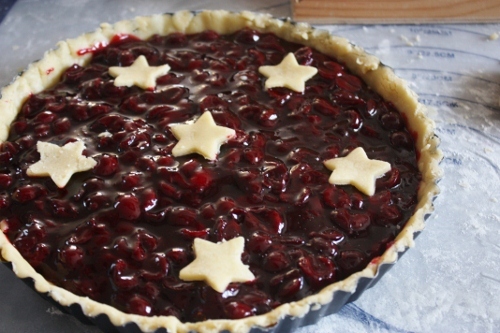 Spoon the cherry filling into pastry and decorate with left over pie crust.